Doral Village offers beautiful existing homes for sale, as well as lots available for placement of your own home. The following is a list of homes we currently have for sale. Please check back often because our listings are updated as homes become available. The perfect home for you may be coming soon! All homes have A/C - Heat, Carport and Storage Shed. Lot numbers 400-521 are in the pet section, please see pet section rules. For a map of Doral Village please click here. Your new home may be coming soon. Lovely home in beautiful Doral Village. 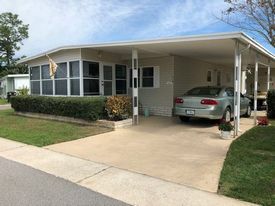 This 2 bedroom, 2 bath, 1974, 24x45 has had some wonderful features done to the home. The flooring is laminate which gives the home a clean look. Most of the flooring has just been installed. The kitchen has been remodeled with newer cabinets, newer counter tops and updated appliances. The refrigerator is new in 2016. The living /dining room are open which feels very spacious. In the front is the raised Florida room. Both bedrooms are ample sizes with the master having a walk-in closet as well as two additional closets. This room also has an en suite bath with a newer walk-in shower and new vanity. For your convenience the guest bath has a shower and tub. This splendid home also has vertical blinds, lightly painted and papered interior walls, washer and dryer hookups, ceiling fans, roof over, vinyl siding, new vapor barrier in 2016, new water heater in 2015, and a new A/C unit in 2012 which has a new fan motor and electrical components installed. The asking price of $69,500 does also include the share. The active 55+ community has a heated pool, hot tub, tennis, pickle ball, putt-putt golf and many planned activities to offer. The location is very close to shopping malls, restaurants, banks, medical facilities, transit, the Pinellas trail, beaches and airports. Please contact Patricia Long anytime for additional information or a showing at 727-505-5591. 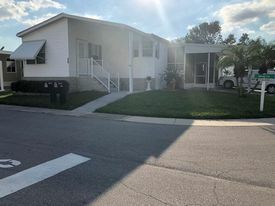 Lovely and well maintained 2 bedroom, 2 bath, 24x48 home being over 1000 square feet in size! 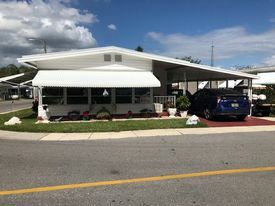 Exterior Features: Vinyl siding, roof over, 10x13 front Florida room with fitted shades, newer windows, new A/C unit in 2017, awnings, two car carport, outside sitting area and 9x15 shed with washer and dryer. Interior Features: Plenty of interior space can be found in the home. Laminate and carpet flooring, vertical blinds, lightly paneled walls, walk-in closets in both bedrooms, abundance of storage space, bonus room off of the kitchen, breakfast bar, updated appliances, fully furnished, walk-in shower, en suite bath. This property will be sold turn key. Community: The park is a gated and active 55+ with lots of activities and amenities. The community allows two cats in this area of the park. The low lot rent of $500 includes water, sewer, lawn, garbage and basic cable. Captivating 2005, 2 bedroom+den, 2 bath, Jacobsen Model Home being almost 1600 square feet in size! 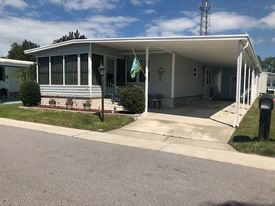 Exterior Features: Vinyl siding, shingle roof, spacious 13x26 screened porch with custom blinds, 10x13 shed with window/wall A/C unit and appealing cloth awnings. A new A/C unit was installed in 2016. The location is within walking distance of the clubhouse and pool. Interior Features: Many high end upgrades have been made to the home. The kitchen has granite countertops(2019), stainless steel appliances(2019), new sink and faucet(2019), bright white cabinets and ceramic tile flooring(2015). The plush gray carpeting is brand new(2019) and flows throughout the home. Ceramic tile(2015) can be found in the laundry room and baths. The front of the home is the enormous living/dining areas with an abundance of windows for plenty of natural light. The plantation shutters embellish all of the windows. Drywall ceilings and walls as well as an inside laundry room are a few more favorable features. Bedrooms are nicely sized and the master is a significant size with wall to wall closet space. The en suite bath has a double vanity and walk-in shower with updated ceramic tile. French doors dress up the den or office which can also be used as a third bedroom. This stunning home will be sold mostly furnished. Community: The park is an active 55+ with lots of activities and amenities. The community is also gated. Two cats are allowed in this area of the park. The low maintenance fee of $180.00 includes water, sewer, lawn, garbage and basic cable. The asking price of $159,900 also includes the share. Call today for a private showing of this fabulous home! Fabulous Location! Corner lot and in the sought after pet section of the community. 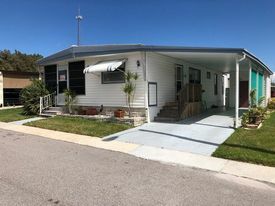 This impressive 2 bedroom, 2 bath home has had many modernized features added which gives it an overall charming feel. The exterior has tasteful curb appeal and a spacious lot. The vinyl siding, roof over, extended shed with washer and dryer, water heater and water softener are outstanding features to add. The interior has an open living/dining area and in view is the relaxing Florida Room with a heat and A/C unit for added living space. The kitchen has attractive white cabinets and a new tiled backsplash. A newer built-in microwave has also been installed. No lack of space in the dining/living areas. You can entertain with ease. The guest bedroom is an ample size with plenty of storage and a guest bath with newer vanity and shower and tub is a convenience. The master suite is located in the rear of the home and also has an en suite bath with newer vanity and walk-in shower. A walk-in closet along with additional closet space gives you a considerable amount of storage. Dressing up the home are the baseboards, ceiling fans, skylight in the living area and the lovely furnishings which most of them will remain. This splendid home has been well kept and is neat as a pin. The asking price of $89,900 also includes the share. Call anytime for a showing or additional information. Two small dogs or cats are welcome! Brand new to the market! Wonderful location is where this 2 bedroom, 2 bath pet section home is located. With a private yard your furry friend can have a place to frolic. The home itself has an open floor plan which makes the feel of the home much larger. The kitchen has ample counter space, tile backsplash, newer dishwasher and leads directly to the dining area with wall to wall built-in cabinet and sizable living room. The front screened porch with ceramic tile flooring, new ceiling and ceiling fan can be seen from these areas as well. Both bedrooms have plenty of closet space with the master large enough for a king sized bed. A separate vanity is outside of the bath and there is also a brand new extensive sized shower. Ceramic tile can be found in both baths with the rest of the home having laminate flooring. Brand new furnishings and decorations will remain in the home. These items are only 3 months old. The home has a tranquil feel and has been very well cared for. The 2 inch faux wood blinds, tastefully painted walls, new roof over in 2013, newer vapor barrier, newer washer and dryer, tankless water heater, newer ceiling fans and attractive light fixtures are a few favorable features to the home. Asking only $39,900! Call today for a private showing. Don't miss out on this opportunity as pet area homes sell very quickly! Brand new to the market is this lovely corner lot home located in the sought after pet section of the community. This 2 bedroom, 2 bath plus den is a 2004 being approx. 1100 square feet in size. The interior has an open concept floor plan with the den being located in the front of the home. The kitchen is fully equipped with all appliances and an island. Neutral cabinets are plentiful. The dining area is just off of the kitchen. It can also be used as a breakfast nook. The living room is a generous size with lots of natural light. A convenient inside laundry can be found in the hallway leading to the bedrooms. A guest bedroom is in the rear of the home and is sizable with the master being an extensive size and holds a king sized bed with ease and has a wall to wall closet. An en suite bath with walk-in shower is within the master bedroom. 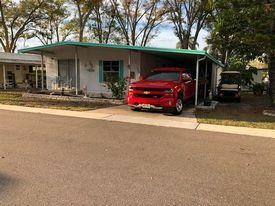 The lightly painted drywall, ceramic tile, laminate, vertical blinds, new A/C unit in 2011, newer water heater within the past few years, ceiling fans, side by side parking, vinyl siding, shingle roof and solar panels enhance this delightful home. The fair price of $125,000 also includes the share! Call Pat anytime for a private showing. 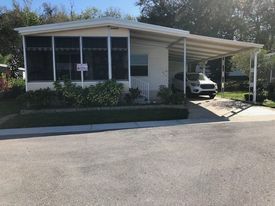 Attractive corner lot 2 bedroom, 2 bath home located in the very popular pet area of the community. Pride of ownership shows in how the home has been cared for. The lot gives you plenty of room for privacy and the front Florida room is a delightful place to relax with a good book. The vinyl siding, roof over, shed with washer and dryer and brand new A/C unit enhance the outdoor features. I side the kitchen has an eat-in area and plenty of cabinet space. It is fully equipped with all necessary appliances. The L-shaped dining/living areas have a very roomy feel and the verticals allow lots of natural light. The guest bedroom is a good size and the guest bath has a shower and tub. The master bedroom is an extensive size with a king sized bed fitting with ease. An en suite bath has a walk-in shower and separate vanity area. An impressive walk-in closet and additional closet will give you ample storage space. This lovely home has plush carpeting and tasteful laminate flooring. Some newer windows and ceiling fans add to the homes features. The asking price of $69,900 also includes the share. Call anytime to take a look or for additional information. Just Listed! 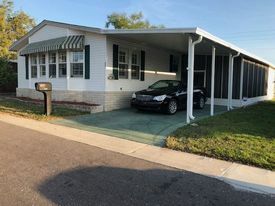 Cozy and comfortable 2 bedroom, 2 bath turn key home. No need to bring anything along but your personal items. This lovely well kept home has a relaxing screened porch along with a shed with washer and dryer. The charming front porch is an enjoyable place to sit out and chat with the friendly residents. Light and bright exterior paint and a newly sealed roof add to the exterior features. Inside is an open kitchen with cool coastal colors. The appliances have been updated and there is an area for additional storage. The dining/living areas are open and spacious and takes you to the front porch. Plenty of natural light fills these rooms. The bedrooms are sizable with the master being large enough for a king sized bed. The en suite bath has a walk-in shower with the guest bath having a shower and tub. A generous sized walk-in closet is also in the master bedroom. Tasteful laminate flows through the home. Vertical blinds, ceiling fans and a reconditioned A/C unit are a few more favorable features. This delightful home will be sold furnished and decorated for your convenience. The asking price is $29,900! Call anytime for a showing or additional information. All prices subject to change without notification.